Kaikoura MP Stuart Smith shared our video the methane mistake on his facebook page. Stuff ran a story which questioned why the MP questioned the orthodox view that agricultural methane was a major source of NZ’s greenhouse gas emissions. 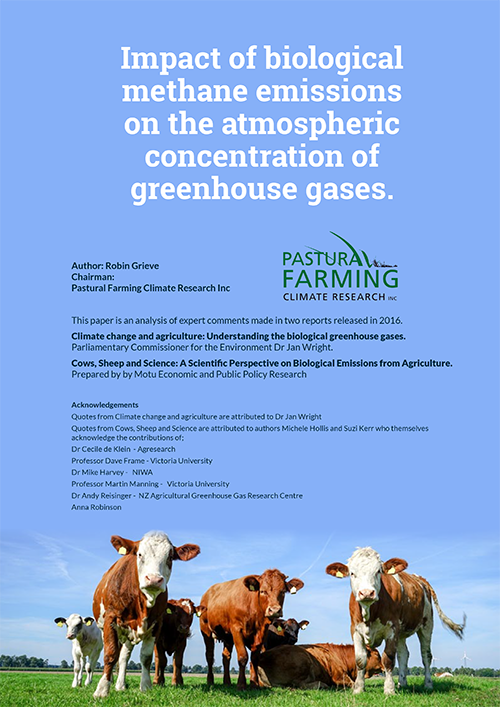 Stuff cited the Ministry for the Environment, Landcare, and NZ agricultural Greenhouse Gas Research Centre as august bodies who held the view that methane was a major problem. Stuart Smith cited a university professor friend had told him that the current method of measuring methane overstated its impact. Stuff quoted Harry Clark who as well as being part of the NZGGRC is an idiot, as saying the video was misleading because he claimed that even stable methane causes warming because “all emissions of methane warm the atmosphere more than if we hadn’t emitted them”. I rang the reporter who wrote the story and explained that what Clark was talking about was historical warming not further warming and that this equally applied to CO2 when it is at net zero. We talked for some time but as often the case you feel that they agree with you but they have been so indoctrinated it is very hard for them to reject their existing mistaken view, and also their job does not allow them to question these things. I asked him to allow me to respond to Clark’s criticism and so that their readers could be informed. Stuff of course don’t allow any articles which question their own misbelief and religion so he and the Editor refused to allow the right of reply that a balanced and fair publication would allow. They did however correct the article to remove Clark’s spurious claim our video was misleading. Well done to Stuart Smith though he stuck to his guns amid the media outrage for what they categorize as blaspheming the global warming religion, which is in fact just him making an accurate account of the science of methane emissions. A footnote to this is that the Editor contacted me to say to say that video had been removed from the story and the comments section deleted, as it was giving some climate change ‘denialists’ an unintended platform. The last time I looked before they deleted the comments the supportive comments of Smith’s stance and our position on methane far outweighed the negative ones, so I think Stuff were more concerned about that than any platform for any so called denialists.